Salt and Sand Flip Flops in Hand!! Sleeps 6, 2 bedroom, 1 bathroom, bonus room, w/d, 250 steps to the beach. Bed sheets, pillow cases, blankets for both bedrooms and air mattress. 10 pillows (4 per br plus 2 extra) Additional throw blankets. Leather couch and love seat, end tables, flat screen tv. Open concept dining/living area. Table with 4 chairs. Additional folding chairs expand seating to 6. The apartment was clean, good TV's and good enough for our needs. Great location for the beach! 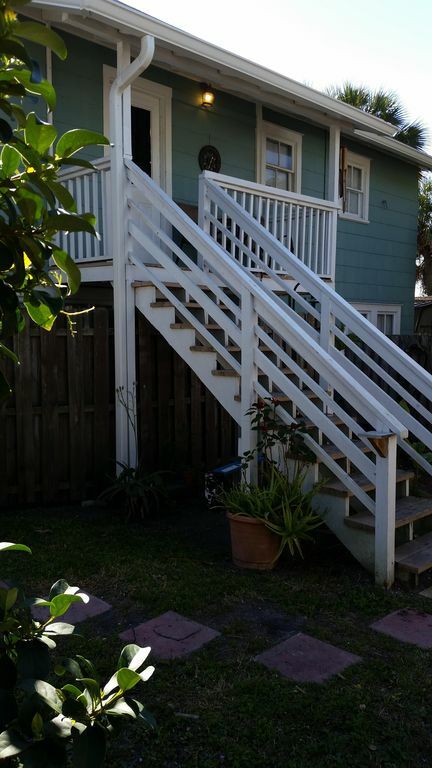 This upstairs apartment has a beach cottage feel - just right for a trip to the beach two short blocks away. All the basic amenities, nice kitchen, two bedrooms with comfy beds, and a futon which was great for the kids. Owners were very responsive and nice. Very spacious place, we loved the short walk to the beach. The location was perfect for our 1-week stay. We so enjoyed, just walking 2-3 minutes to the spectacular beaches. The place was clean and welcoming. Erin is very responsive to answer questions & help. There was plenty of room for 5 of us with 2 bedrooms & a futon. The mattresses were comfortable. Plenty of closet space & a dresser in each bedroom. We were able to get by with 1 bathroom. The weather was awful while we were there - coldest in over 30 years, so we didn’t even get to the beach. We were pretty confined to the unit because of the weather. Comfortable furniture for visiting & playing games. Looks like easy to get to the beach as it’s close. Not high-end accommodations but comfortable. Cozy beach bungalow with fantastic beach access! Our extended stay in this property was very positive. Erin and Shar were friendly and very accommodating, quick to respond to any concern. We enjoyed the many amenities beach life offers while living here. Pet friendly facility greatly appreciated. Minimum stay for weekends is 2 nights, holiday weekends is 3 nights. Reduced cleaning fee $50 for stays of 3 nights or less. $50 fee per pet - max 3 pets.